Adding another piece to the monster tone puzzle, the Floyd Upgrades Brass Spring Claw. I’ve been working my way through my Ibanez RG550 RFR reissue, testing out a range of Floyd Upgrades tremolo parts. First up was the Brass Sustain Block for Ibanez Edge. In my review of the brass sustain block I found it made for a massive tonal upgrade over the nasty-looking stock pot metal blocks Ibanez use. I went from having a guitar that sounded a little flat to something with real body and life, and a nice boost in sustain. Next up was the Noiseless Springs, and in my review of the springs I found that they did a wonderful job of killing that nasty echo type noise that you get from regular tremolo springs. The next upgrade in the chain is the spring claw. Adam from Floyd Upgrades provided me with one of his Brass Spring Claws. It is said that the regular pot metal claws found in many tremolo equipped guitars can rob the guitar of tone. Upgrading to a better quality, tonally speaking, metal gets rid of the weakest link in the chain. 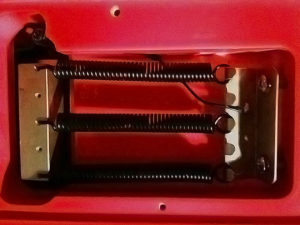 I was a little unsure of how much of a difference a brass spring claw would make on my tone, especially since the brass sustain block already provided such a large boost, and the noiseless springs got rid of the unwanted noise that is typically experienced with tremolo equipped guitars. Let’s just say after installing the brass claw I was pleasantly surprised. When I installed the brass sustain block I really liked all the boost in fullness of tone. The stronger low end, and increased mids were a welcome addition, as was the sustain. One thing that I noticed was that I had lost a little high end. Installing the brass spring claw not only boosted the high end in my tone, but introduced a new level of clarity and note separation. Notes really popped out of my guitar, even with a decent amount of gain. The clarity and note separation was noticeable both acoustically, and when it was plugged in. Originally my RG550 was an amazing guitar with regards to playability, but the tone was a little lifeless. These three simple, cost effective Floyd Upgrades additions have really turned my fantastically playable guitar into an amazing tone monster. Overall the Floyd Upgrades Brass Spring Claw is a pretty impressive little upgrade. I would never have previously thought that something as simple as the humble spring claw could have such an effect on the tone of a guitar. The brass claw did however make a small, but significant improvement to the tone of my guitar. I encourage others to try this upgrade in conjunction with a brass block upgrade if they find that their guitar’s tone is a bit lifeless and flat. 3 Responses to "Floyd Upgrades Brass Spring Claw – review"
i have a 80’s rg550 and the edge tremolo is acting up and i want to put on a new floyd rose tremolo, how ever i have some concerns about the fitting. if a floyd will fit on the two pivot posts on my ibanez with out doing a complete modification to move the the posts around. I believe that the Original Floyd Rose trem should fit, but what is wrong with your Edge? The Edge and Lo Pro Edges are considered some of the best Floyd Rose type bridges out there. I’m sure with a little maintenance it would be back up to scratch in no time. Send me an email through my contact me link and arrange to get some images to me, and we’ll see how it looks.